_Northants gave a very good turn out for this years Northern Gigafinal at Derby, with 26 players making the trip, and three of these qualifying for the Terafinal. Congratulations to Seth Tsang, Ryan Reed, and Max Miller who will be invited to make the trip to Loughborough in August. Seth and Ryan both scored 4.5 out of 6 in their respective sections, resulting in both of them finishing in joint 3rd place, whilst Max scored 5 and finished a very impressive joint 2nd. Many of the other players were extremely close to qualifying, and Eva Ressel and Joshua Owen were very unlucky, as they both also scored 4.5 out of 6 but had to settle for joint 4th in their sections. Also finishing joint 4th were Connor Arthurs, Tyler Gwynne and Pacey Gwynne who all scored 4 out of 6. Well done to every player for their performances, and if you would like to see all the scores from all the sections just click here. Thomas Arthurs came out the winner of the Under 14 section of this years competition, with Kyle Patel winning the Under 12 section. In the Team competition the Under 11 section was won by Cedar Road Primary School, and the Under 9 section by Rewell Junior School. Congratulations to all the winners of each section - the full results from this years competition can be found here. ECF Under 13 Championships - the champions! _On a very hot last Sunday in June the ECF Junior County championships took place, which consist of three sections for older children, and Northants took a team of 6 to play in the Under 13 Minor competition. This year the tournament was played at the famous Eton College, where our team comprised of Marcus Rose, Sam Herring, Owen Robinson, Eva Ressel, Seth Tsang, and Lewis Newton. Northants were up against 6 other strong teams from around the country. In all of the first three rounds they scored a very consistant 4.5 out of 6. But in the fourth and last round a score of 3 left all the players biting their nails until the final scores were calculated - and Northants had beaten Norfolk into second place by just half a point! Every player was integral to this wonderful success for Northants, and many congratulations to all six on their wonderful performance. For the full results click here. Three Northants players made the trip over to Newmarket for this years East Anglian Chess Union Congress - a long play event lasting two days - and all came away with prizes! In the under 130 grade competition Eva Ressel and Owen Robinson went into the last round as leader and joint 2nd place respectively. Unfortunately their last games were not kind to them, but Eva finished in a superb 2nd, with Owen finishing the highest scoring under 110 grade, and so both took home some prize money! Here you can see Eva and Owen looking a little bit apprehensive before their final games at the EACU Congress - Eva on board 1, and Owen on board 2. Well done to both players._ In the under 170 section, Marcus Rose played well and came away with the top junior prize. A good weekend was had by all, and Eva was the talking point amoung many of the adult players - well done Eva on a wonderful weekend. _Sam Herring & Eva Ressel both scored 3 out of 5 to finish joint 7th in the Minor Section of this tournament, played in the Garden City of Letchworth. All results can be found here. _This took place recently in Peterborough, and Sam Herring scored 3 out of 5 to take the Junior Prize in the Challengers section. In the same section Sam's father Tim made it a family affair finishing in joint 2nd place - congratulations to both Sam and Tim. All the winners can be found here. _Three teams from Northants recently travelled to Prestatyn in Wales to take part in the semi-final of this years tournament. 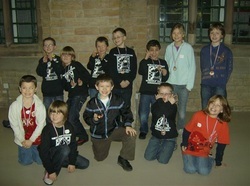 In the under 9 section Redwell Junior achieved 9th place out of 26 teams. Their team consisted of Pacey Gwynne, Reece Patel, Tyler Gwynne, Connor Arthurs and Myles Collymore. In the under 11 tournament, Great Houghton played in the main section and finished 19th out of 34 with the team of Samuel Libertiny, Jade Miller, Nathan Judge, Hugo Darcy-Nesbitt and Max Miller. Whilst in the plate section Cedar Road finished 2nd out of 8 with the team of Ryan Reed, Finlay Martin, Rais Hussein, Laura Cox, Joshua Hanson and Ethan McInerney. Well done to all three teams on representing Northants so well. This year we hosted the local Megafinal at Malcolm Arnold Academy in Northampton, with over 150 players taking part. Northants players fared very well with a number of our players qualifying for the Northern Gigafinal in Derby in July. In particular, scoring 6 out of 6 and winning their sections were Max Miller, Eva Ressel, and Seth Tsang. Also, Sam Libertiny and Sam Herring both won their sections scoring 5 out of 6. For a list of all the scores of the Rockingham Megafinal click here. We hosted the finals this year at Malcolm Arnold Academy, and many congratulations to the new champions Kent, who scored an astonishing 51.5 points out of 60 - a record score in the history of this competition! Northants gave a very good show for ourselves, finishing a very respectable 12th out of 18, and all the squad can be very proud of themselves, especially Jonathan Hare who finished on 3 out of 3, and Ryan Reed who was our other undefeated player on the day. A fuller report can be read on the ECF website, by clicking here. Seth Tsang recently represented Northants at the EPSCA Under 11 Team Trial in Liverpool. He came oh so close to qualifying, missing out by just half a point with a score of 3 out of 6. Well done Seth for putting up such a good showing for Northants.The scores and crosstables of the two day trial can be found via the EPSCA website which can be found by clicking here. Northants were represented by 6 players at the recent National Junior Squad Championships played at The Royal Wolverhampton School - 5 in the Under 12 section, and 1 in the Under 14 section. In the Under 12s, congratulations to Owen Robinson who secured a half norm, scoring 3.5 points. Also taking part in this section were Sam Herring (3 pts) Seth Tsang (2.5 pts) Eva Ressel & Ryan Reed (both 2 pts).In the Under 14 section Marcus Rose scored 3.5 points, making this a good showing by all the players. All scores and results can be found here. _Our under 11 team travelled to Norwich to take part in the EPSCA Under 11 East Zone, hoping to qualify for the finals in May. Despite a number of players missing for this event, they put up a very good and consistent effort, missing out on an automatic qualification by the narrowest of margins - half a point! Everybody played well, including a number of under 9 players who were included for the day, and all the team enjoyed their day. The top 5 qualify. However, as we are hosting the finals in May, we will also be eligible to enter a team. You can see all the results from the various zonals - simply click here. 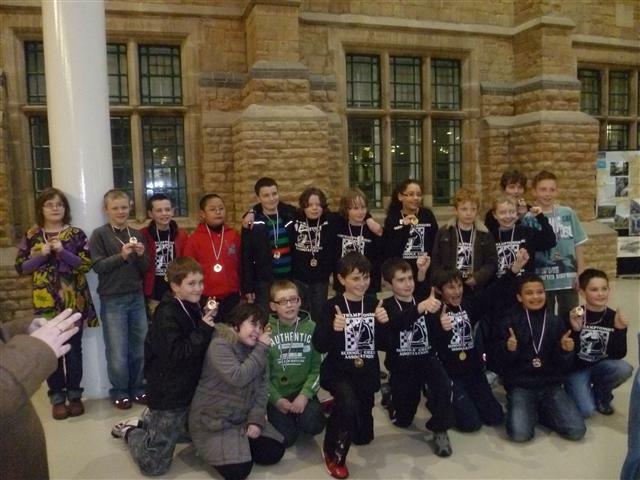 _The NSCA took an Under 11 and an Under 9 team to Nottingham on March 5th for this seasons Midlands Championships - and a very successful trip it was too! A huge congratulation to all the players who took part for Northants - everybody played well, behaved well, and generally had a very enjoyable day. All we need to do now is replicate this performance in the upcoming Under 11 zonal match in Norwich on 19th March!!! The 25th Wilts and West of England Championships took place at Swindon during the weekend of 26th - 27th February, and Northants had a number of players present this year. In the Under 12 Championships, Sam Herring, Eva Ressel, Owen Robinson, and Seth Tsang were all playing, and they all scored the same, achieving 3 out of 6. In the Under 10 section Ryan Reed scored 1.5 out of 6, and in the Under 14 section Marcus Rose scored 2 out of 5. 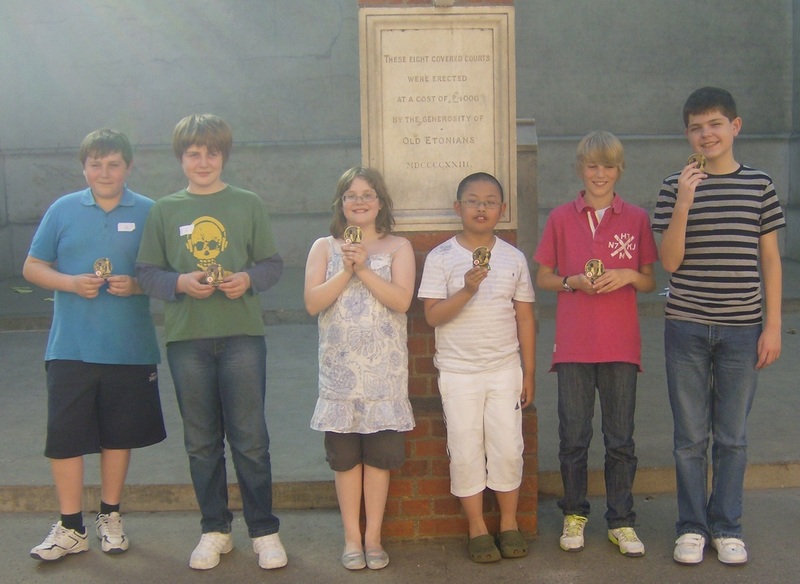 A full list of the winners, along with cross tables, can be found by exploring the Wiltshire Junior Chess website by clicking here. 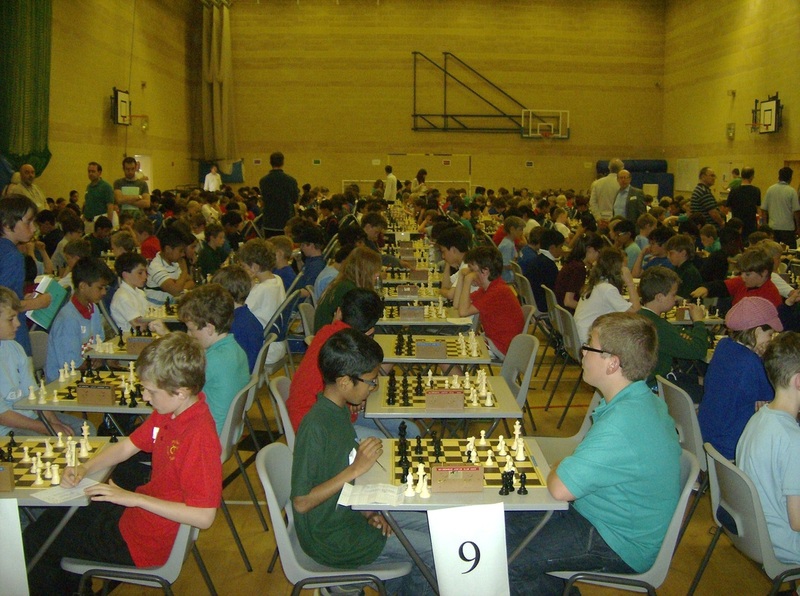 This years championships took place at Cedar Road Primary School, and was a great success with over 100 children playing some wonderful chess in a number of sections. Many thanks to the Head of Cedar Road, Kay Gerrett, for allowing us to use her school for the day, and in helping make this one of our most successful events ever. Alan Bailey, a long time supporter of the NSCA, presented the prizes to the winners, and details of those winners can be found by clicking here. During the last weekend of January Yateley Manor near Camberley hosts both the English Closed Championships and the South Of England Championships. In the Under 14 Closed Section of the English Championships Marcus Rose was disappointed with his score of 1.5 out of 5, although 2 of his losses were against the top two graded players. In the Under 7 Open section however, congratulations go to Max Miller who scored 5 out of 6, and was joint winner. The top positions in all sections can be found by clicking here, whilst the crosstables for the Closed Championships can be found by clicking here. More on the success of Max can be found by clicking here. Owen Robinson & Seth Tsang made the journey down to Barnet recently, to play in their schools individual championships - Owen in the Under 12 section, and Seth in the Under 11 Section. Owen came joint 3rd with 4 out of 6, losing only to the players finishing 1st and 2nd. Seth came joint 6th, scoring 4.5 out of 6. Well done to both players. Winners and crosstables for all sections can be found by clicking here. Many congratulations to Pacey Gwynne, who scored a wonderful 6 out of 7 to jointly win the Under 8 section of the EPSCA rapidplay championships in Liverpool - a brilliant result ! Pacey was not the only Northants player in attendance, as in the same section his brother Tyler scored 5, as also did Reece Patel, whilst Connor Arthurs scored 4.5. Ryan Reed also made the journey to Liverpool, and scored 2.5 out of 6 in the Under 10 'A' section, and Samuel Libertiny played in the very tough Under 11 section. A great set of scores from all these players, and again many congratulations. _The 7th Northamptonshire Christmas Congress (the traditional Christmas Cracker) took place on 30th December at Ruskin Junior School in Wellingborough. The numbers for this tournament were up yet again, and this is proving to be a very popular year ending competition. Under 9 : Connor Arthurs. Congratulations to these, and all the players that took time out from their Christmas/New Year holidays for a day of chess. 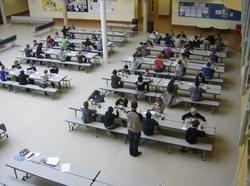 _The second helping of LJCC action took place 28th-30th December. This time it was the turn of the under 12s and the under 8s to play, with more Northants players taking part. As with the under 10s, a big well done to these Northants squad members in what is a very tough competition with some extremely strong players taking part. All the scores and winners can be found on the LJCC website here. _The first weekend of the LJCC took place 11th/12th December, and 4 under 10 players from Northants made the journey down to Harrow for this prestigious competition. In the major section Ryan Reed led the Northants players with 2.5, and Nathan Judge & Samuel Libertiny scored 2.0. In the minior section Sam Young scored 1.5. A big well down to these players in what is a very tough competition with some extremely strong players taking part. All the scores and winners can be found on the LJCC website here. Meanwhile, in the opposite direction, Marcus Rose and Owen Robinson made the journey to Liverpool to be part of the Midlands team taking part in the annual weekend quadrangular against teams from Wales, Scotland, and the North of England. In the under 14 section Marcus Rose also scored a win and two draws, but unfortunately it wasn't enough and the Midlands were beaten into second place by the North. There was also an under 16 section, which was won by Scotland. Very well played to both players - an unbeaten weekend for both. _After an extra inter county match was hastily arranged by Nottingham, which would have allowed us some extra practice and the first county matches for some players, the weather intervened to stop the match taking place. If the match should be rearranged we will let you know, otherwise it is individual competitions for the next month or so, and then Christmas to enjoy! _This years Wellingborough District Scouts Chess Competition was won by our own Nathan Judge with 4 wins and a draw - I understand Nathan now has a very large trophy to look after! Congratulations Nathan. 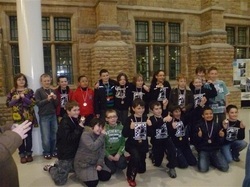 _This years Northants Junior Congress was a resounding success, with some wonderful chess being played in all sections. With this years event being a qualifier for the LJCC (London Junior Chess Championships) there was even more to play for than usual, and over 100 entrants braved the cool surroundings of Malcolm Arnold Academy !! 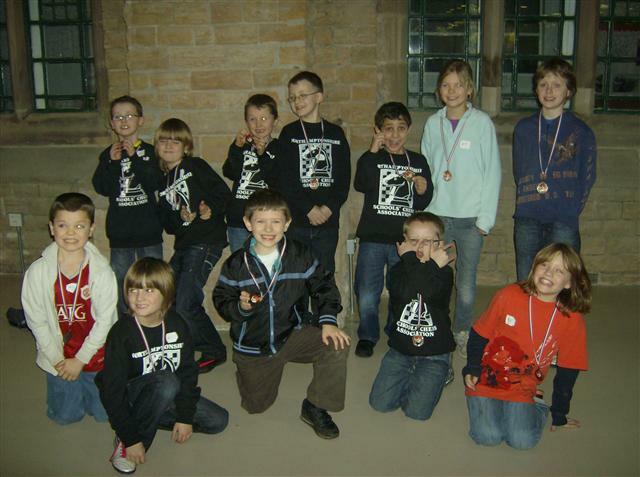 Two players scored the maximum possible, with Samuel Libertiny scoring 6 out of 6 in the Under 10 section, and George Ivanov, who had travelled up from London, obtaining the same score in the under 12 section. Seth Tsang continued his travels, this time going north to Nottingham to take part in this two day event over the weekend of 16th/17th October. The trip proved to be very worth while as he came away with an impressive 3 out of 5 - congratulations Seth. _Following on from their performances at St Albans, Seth Tsang and Owen Robinson travelled the following weekend to Enfield, where this time they both succeeded in qualifying for the LJCC Under 12 Major competion - a very well done to both players. A number of County chess players made the journey down the M1 to St Albans recently to take part in the Hetfordshire Schools Chess Association Congress, which was also a qualifier for the LJCC. In the under 12 section Seth Tsang, Thomas Arthurs & Harry Bowman all succeeded in qualifying for the Minors, whilst the county was also well represented by Owen Robinson, Kyle Patel, and Bradley Purdey-Lovell. Joshua Owen played in the under 10 section, and in the under 8 section we had 4 representatives, with Connor Arthurs and Tyler Gwynne only just failing to qualify for London, but Reece Patel and Pacey Gwynne both qualifying with scores of 4 out of 6 - in Pacey's last game he even beat the under 8 British Champion! Well done to everybody who played, and especially to Pacey on that wonderful last round win. 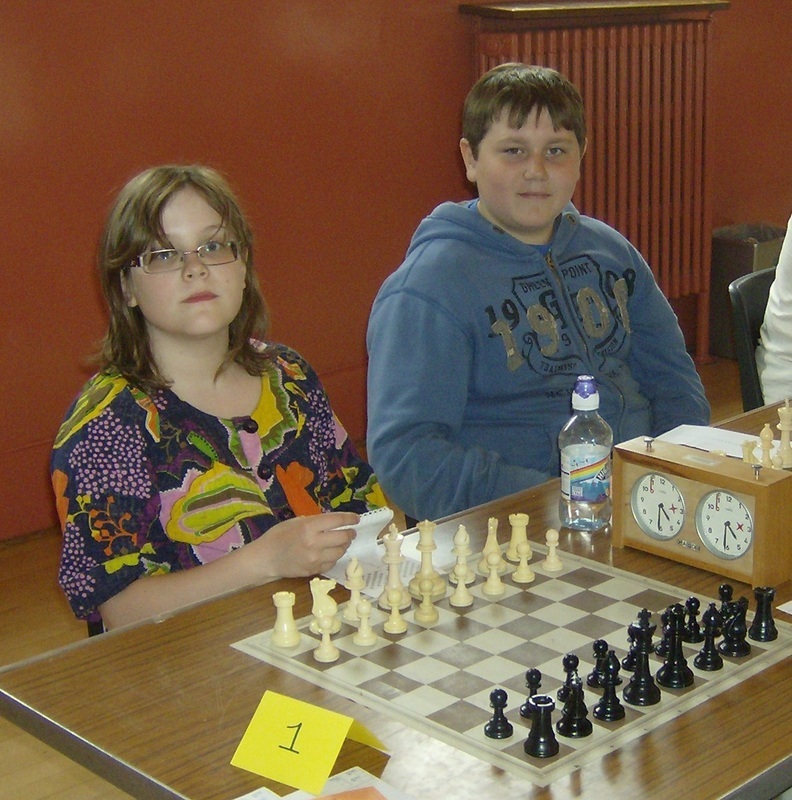 Click here to go to the Herts Junior Chess page, where you can find all the relevant crosstables. _This years Terafinal took place in Warwick over the weekend August 21st - 22nd. Northants was represented by Owen Robinson and Seth Tsang in the Challengers, and they both got very respectable scores, with Owen scoring 3 wins out of 6, and Seth 2 out of 6. Well done to both players. For a full set of results, including links to cross tables click here. _Marcus Rose played his first international match recently since qualifying to play for England, when he was chosen to be part of the Under 12 team in the above event - an annual home nations tournament where teams from England, Wales, Scotland and Ireland play for 4 cups. Three in different age groups, and one for the girls team. This years event was held in Wales. England did incredibly well, coming away with all 4 trophies, and Marcus scored 4 out of 6. For more details visit the Welsh Chess Union website here. 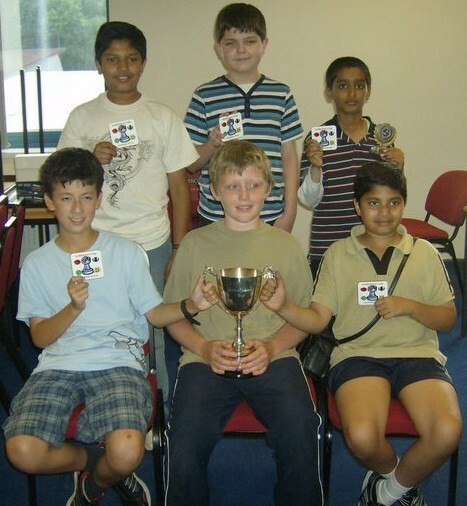 This photograph shows the winning Under 12 England team. Connor Arthurs, Reece Patel, Pacey Gwynne, Tyler Gwynne, Thomas Arthurs, Kyle Patel, Seth Tsang, and Marcus Rose. Good luck also to James Jackson, who is taking part in the "main event" - the actual Championships. He will be playing 11 games of up to 7 hours !!! To find out more about the tournament, and to check how they are all doing, you can visit the championships website here.